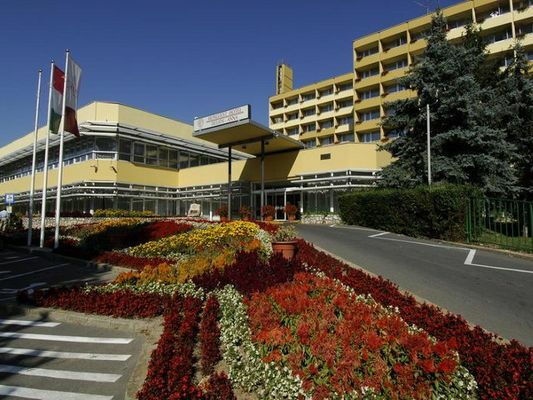 The hotel has its own medical centre, special staff and indoor thermal pool (13 m x 9 m, water temperature 34 oC, own thermal well). Our guests can take advantage in the frame of the medical cure of the following treatments: physician's examination, massage, medical gymnastics, water gymnastics, acupuncture, packs (flour, mud), physiotherapeutical treatments (ultrasound, interference, galvanic current, selective stimulus current treatment, galvanic bath, electric bath, magnetic treatment, iontophorese, diadynamic, sollux- and bioptron lamp, kriotherapy, inhalation, TENS treatment, decimeter wave), hydrotherapy (hydroxeur, weight bath, underwater jet massage). 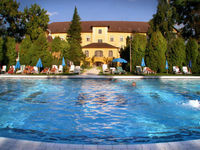 In summer in the garden: open-air swimming-pool, garden chess, petanque, for children: pool for childre and playground. Restaurant Borostyán offers international, Hungarian traditional and vegetarian foods to our guests in buffet form or a'la carte. In the lobby bar (08:00-23:00) there is Live Music on Friday and Saturday evenings. We offer coffes, teas, cakes, cocktails and drinks. Opening hours of restaurant: 07:00-10:00, 12:00-14:00 and 18:00-21:00. Conference room for 120 people, a smaller section room for 20 persons, and there is another one for 35 people, attached to our restaurant. Technical equipments: overhead projector, video, television, amplifier, flip-chart, podium, telefon, fax, pulpit, microphone, public address system, projector. The 150 double rooms and 12 suites in the air-conditioned Hotel Anna (main building) have bathroom (with bath tube), toilet, balcony, television, minibar, telephone and safe. In Hotel Benjamin there are 42 double rooms, 2 single rooms and 4 triple rooms equipped with shower/ toilet, television, minibar, telephone and safe.